CHASING FOOD DREAMS: Chatz Brasserie, PARKROYAL Kuala Lumpur: Chef Debbie Teoh’s Nyonya Feast Is Back! Chatz Brasserie, PARKROYAL Kuala Lumpur: Chef Debbie Teoh’s Nyonya Feast Is Back! If you had read my previous posts here and here, you would know how much I love Chef Debbie Teoh’s dishes. A true blue Nyonya, this petite chef wears many hats among her repertoire for serving up some of the best authentic Northern and Southern Nyonya cuisine. Now Debbie do not own any restaurants but she does have her own catering services so it’s not easy to be able to savor her dishes on a daily basis. 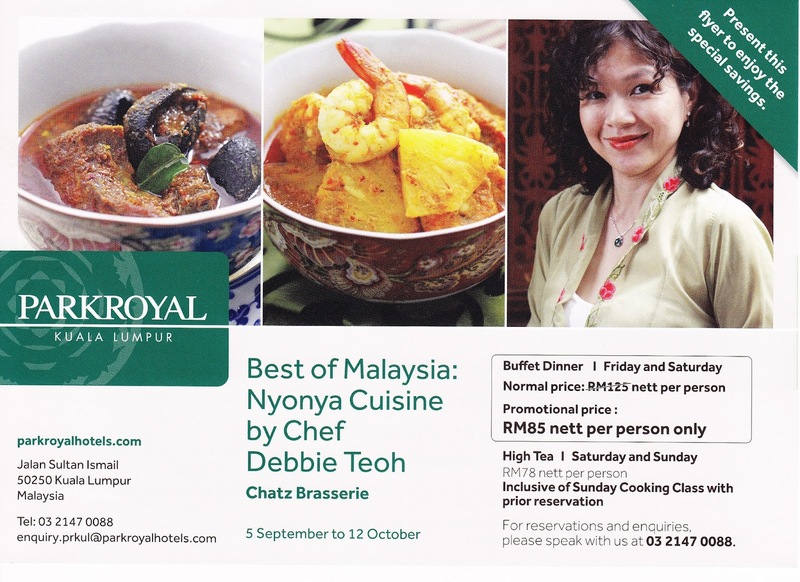 The good news is that PARKROYAL Kuala Lumpur is proud to welcome Chef Debbie Teoh back to Chatz Brasserie with her authentic Nyonya feast through a buffet dinner on each Friday and Saturday from 5 September to 12 October, 2014. That’s not all, there is even a High Tea on each Saturday and Sunday available together with a Sunday Cooking Class with Chef Debbie! 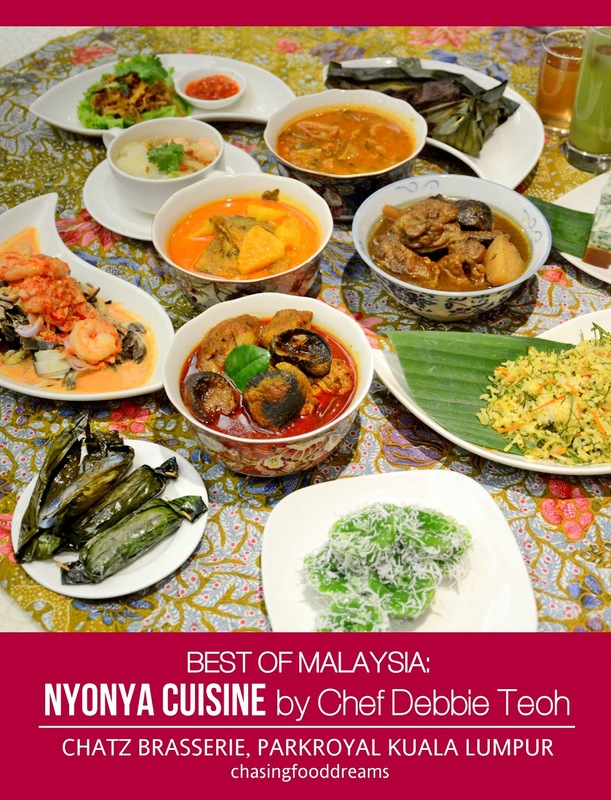 It’s the perfect moment to catch a taste of the talented Chef Debbie’s Nyonya cuisine if you still haven’t had one. Chef Debbie is set to whip up an unforgettable Nyonya spread from her repertoire of Nyonya dishes perfected through her 17 years of experience in the food industry. Born to a Baba from Malacca and a Nyonya from Penang, Chef Debbie’s heritage allows her to master both Northern and Southern Nyonya dishes to a tee. She also has a long list of other talents that include foodie, author, food stylist, ambassador for the Nyonya cuisine and culture, food catering business and is a Nyonya Food Consultant for Tourism Malaysia. Here’s a delicious sneak peek at the offerings available at the ‘Best of Malaysia: Nyonya Cuisine by Chef Debbie Teoh’ buffets and Hi-Teas. Kick start the feast with Chef Debbie’s signature Hu Pio Soup filled with delicious homemade prawn balls cooked in a chicken stock and laden with the luxurious fish maw. I have tasted this soup a few times and each time is always as good as the one before. Sweet and earthy, the soup is savored in many Nyonya households, especially during festive seasons. A Nyonya feast would not be complete without the classic Ju Hu Char. All the ingredients in this popular dish are still hand cut to achieve the true flavour and texture of the Ju Hu Char. The vegetable is perfect with rice or crispy fresh lettuce and a dollop of pungent Sambal Belachan. The Nyonyas are famous for their kerabu salads. This comes from the influence of the Malay heritage in the Nyonya. At Chef Debbie’s Nyonya feast, one can savor the Kerabu Jantung Pisang with Prawns among other kerabu salads. It’s really unique and features the heart of the palm from the banana tree which is mixed with fresh shallots and a spicy kerabu dressing with a coconut milk based. Prawns are added for extra deliciousness! The next three main dishes are usually savored with rice. These dishes are thoroughly complex and require many elements of spices and herbs to achieve a unity of balance in flavours. Ayam Buah Keluak may not be everyone’s cup of tea but it is certainly mine. This dish calls for the distinctive Buah Keluak, a type of black nut that is poisonous. This nut is made edible by fermentation and so it has to be treated properly for cooking and takes weeks in advance for preparation. Chef Debbie’s Ayam Buah Keluak is marvelous. A complex curry that is made unique from the buah keluak, I kept taking the black nuts and scooping out the keluak paste to be mixed with the curry. The intense nutty notes with an aniseed flavour and aroma takes some getting used too for some so one will either love this or hate this nut. Chef Debbie’s Ayam Buah Keluak is gorgeously thick and spiced up so make sure to at least try this if you see it at the buffet. Melaka Ayam Pongteh is another dish that often appears in many Nyonya households on a daily basis. The dish calls for slow braising of chicken, potato and mushroom in a bean paste sauce with some spices. Our Melaka Ayam Pongteh was creamy and rich with a savory nutty flavour. The tender chicken and potato stew is comfort food at its best. Lemak Nenas Ikan Sepat is definitely a curry that hails from the Malay side of the heritage as I have often seen this curry in many Malay stalls. Chef Debbie makes a mean version of this as the balance of the spices in the curry is boldly seasoned with the saltiness of the salted Ikan Sepat and brightened up with the tangy flavours of the pineapple. So one gets lemak, salty and fruity sweetness all in one taste. Other delicious dishes to look out for are Fish Tempra, Lemak Udang Nenas, Telur Cincalok, Nasi Kunyit with Chicken Curry and Sambal Kiam Hu, Melaka Laksa Lemak, Gulai Kiam Hu, Ayam Kapitan, Pai Tee, Geram Asam, Itek Tim and Lemak Sukun. The next two dishes are not part of the buffet but can be ordered a la carte for additional price. These are the almost gone classics that are difficult to order these days as it requires lots of work and special ingredients. I must say though that you should order these to try as both dishes are practically non-existence in many Nyonya restaurants now. I am talking about Chef Debbie’s Pais Buah Keluak and Gulai Perut Ikan. Pais Buah Keluak resembles the Nyonya Otak Otak texture, a steamed spiced up fish mousse. This one is spiced up with the creamy buah keluak and fish paste. Steamed in banana leave, the aroma and flavours are tantalizing and very moreish. It is pretty strong in flavours of the black nut so it may take some getting used to at first bite. Nevertheless, the Pais Buah Keluak is pretty much a yummy exotic dish in my books! It is available as an a la carte order at Rm30 nett for two pieces. The Gulai Ikan Perut is my favorite of the night! Another dish that make use of fish stomach pickled and brine before being cooked in a tamarind based sauce, the Gulai Ikan Perut is also slowing showing up less and less in the Nyonya restaurants these days. It’s a lot of effort for selecting the herbs and cutting them and takes days in advance to make due to the fish stomach. Cooked with pineapples, eggplant and lots of various herbs, all these ingredients will be cooked slowly to imbue the fish stomach and tamarind sauce. Chef Debbie’s Gulai Ikan Perut evokes a harmony of complex flavours of savory, sour and sweet with a unique herb aroma. This dish will have one refilling their rice simply just to savor this heavenly concoction. It is priced at RM35 nett per bowl, inclusive of steamed rice. Chef Debbie’s Nyonya desserts are always so good! I can still remember how awesome her Seri Muka with Yam was two years ago. This year, her Rempah Udang, Talam Chendol and Kuih Kosui is just equally as delicious. The petite Rempah Udang is so flavourful and pretty. Talam Chendol is creamy with a very delectable layer of the rich Gula Melaka. Her Kuih Kosui has such a bouncy QQ texture and is not overly sweet, perfect with the layer of fresh grated coconut. Make sure to save room for her Nyonya kuihs! The Buffet Dinner is available on Friday and Saturday from 6.30pm to 10.30pm, priced at RM125 nett per adult and RM62.50 nett per child. Diners may enjoy this promotion at a promotional rate of RM85 nett per person from 5 September to 12 October. During the weekends, Hi-Tea is available on Saturday and Sunday from 12.30pm to 4.00pm. Hi-Tea is priced at RM78 nett per adult and RM39 nett per child. Diners will also have the privilege to enjoy complimentary Nyonya cuisine cooking classes before Hi-Tea commences with prior reservations. Wish I were in KL. Would surely go and enjoy everything! I love peranakan/nyonya...A LOT!! !